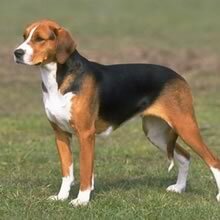 The roots of the American Foxhound can be traced back to 1650, when hounds bred to hunt foxes by smell were first imported from England by Robert Brooke. Descendants of Brooke’s dogs were bred with French Foxhounds which had been given as a gift from Lafayette to George Washington, creating the prototype of the modern breed. Over the next century, the American Foxhound became increasingly popular in the south, bred to chase deer and catch and kill foxes alone. They became taller, faster, and distinct from the English Foxhound. Several strains were bred to specialize as runners, pack hounds, or show dogs, such as the Walker, July, and Trigg. Pack dogs are the prototypical American Foxhound; they are fast runners and great jumpers with high stamina. Today, the American Foxhound is more popular as a working pack animal than a registered show dog. The American Foxhound is the state animal of Virginia. The American Foxhound has a shoulder height of 53-64 cm (21-25 in) and weighs 29-34 kg (65-75 lbs). Some show dogs can be larger. American Foxhounds have a long, narrow muzzle with domed skull, wide, floppy ears, and narrow chest. They have long, straight legs and a high, cheerfully arched tail. The American Foxhound has a medium length, close, hard coat. All possible colors are allowed; a mixture of brown, black, and white, with white legs and muzzle, is common. They are an average shedder. Though traditionally not a house pet and highly independent, the American Foxhound behaves well in the home and is easy to live with. American Foxhounds are tolerant, friendly, and gentle. They are intelligent enough to open some gates and doors and overcome other obstacles. American Foxhounds do not bark frequently, but they have a loud, deep, melodious bark. Though traditionally not a house pet and highly independent, the American Foxhound behaves well in the home and is easy to live with. American Foxhounds are tolerant, friendly, and gentle. They are intelligent enough to open some gates and doors and overcome other obstacles. American Foxhounds do not bark frequently, but they have a loud, deep, melodious bark. The American Foxhound is at its best with plenty of human companionship, and prefers to have other canines around. It is very sociable, and should not be expected to live alone, although it is usually reserved around strangers. American Foxhounds get along very well with children of all sizes. They are usually too friendly to make good watchdogs! You can find American Foxhound puppies priced from $0 USD to $0 USD with one of our credible breeders. Browse through our breeder's listings and find your perfect puppy at the perfect price. The American Foxhound is at its best with plenty of human companionship, and prefers to have other canines around. It is very sociable, and should not be expected to live alone, although it is usually reserved around strangers. American Foxhounds get along very well with children of all sizes. They are usually too friendly to make good watchdogs! The American Foxhound requires occasional brushing to remove dead hair. Bathe only when necessary. American Foxhounds can live outside in warm climates as long as shelter, bedding, and ample socialization are provided. Avoid overfeeding to prevent obesity. The American Foxhound has a lifespan of 10-13 years and is generally healthy. It has litters of 5-7 puppies. The American Foxhound should be trained with a firm, no-nonsense approach. However it is trained, it is unlikely to obey commands and avoid dangers once on the trail, and must be watched carefully. American Foxhounds are sometimes difficult to housebreak. Bred to hunt, the American Foxhound is always ready to hit the trail. Daily exercise, preferably a long walk or a jog, is necessary. Allow the American Foxhound to run off a leash, but only in a safe, enclosed area. If left unexercised or without companionship, the dog may chew and scratch objects around the home. The American Foxhound is not well suited for apartment life. American Foxhound Puppies for Sale - Shipped Worldwide! Finding the right American Foxhound puppy can be dog gone hard work. PuppyFind® provides a convenient and efficient means of selecting and purchasing the perfect American Foxhound puppy (or American Foxhound puppies) from the comfort of your home, 24 hours a day, 7 days a week. Take advantage of our PuppySearch or leisurely browse our directory of hundreds of dog breeds, American Foxhound dog breeders, American Foxhound dogs for adoption, and American Foxhound puppy for sale listings with photos and detailed descriptions. Some American Foxhound puppies for sale may be shipped Worldwide and include crate and veterinarian checkup. Many American Foxhound dog breeders with puppies for sale also offer a health guarantee. With thousands of American Foxhound puppies for sale and hundreds of American Foxhound dog breeders, you're sure to find the perfect American Foxhound puppy.